It happened. I was working on my computer when the screen froze. Ctrl-Alt-Del didn’t work. I shut my computer off, then turned it back on. I got the blue screen of doom. I researched the error message. There was a problem with one of my input devices. I found some tips on how to resolve the issue. None of them worked. I went into system utilities and ran a check on my hard drive. The test failed. My hard drive had crashed. Panic set in. How was I going to update my website? How was I going to put together the yearly genealogy newsletter? Where are my photos???? First, I wasn’t computer less. For once, I had another computer, my Lenovo Flex 3 2 in 1 laptop/tablet. 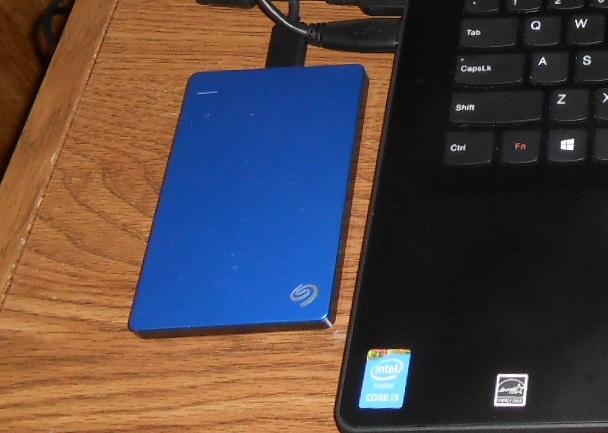 Backing up all my files to an external hard drive. In 2016, I got a Seagate External Hard Drive for my birthday. It has 1 TB (terrabyte) of storage and can be set to backup files continuously. It comes with 200 MBs of cloud storage which I haven’t taken advantage of. It’s only good for two years. I don’t want to depend on the temporary. It’s small, so it doesn’t take up much space. The dimensions are 2.99″ x 4.47″. It’s just .38″ thick. Compact enough for travel or emergencies. Grab the dog and the hard drive and run out of the house! It connects via a USB cable and can work on devices with a USB port. I wasn’t expecting a live test so soon after I go the drive, but here I was with a fancy laptop and thousands of files stuck in storage. I was somewhat confused as to how this whole restoring thing worked. The file directory structure on the drive if befuddling. It looked like the files were kept in bits and pieces in directories each time I ran the backup utility. How was this going to rebuild my PC folders on my 2 in 1? I hope I wasn’t going to have to do it one by one! When you have no other choice, the only course is to plow full speed ahead. I plugged the drive in, set it up to restore my files, watched as it copied file after file to my laptop. File structure: All my files were in the exact same folders that I had on my old PC. Everything was in its place. I now have two users names on my laptop…both me. Note to self: Use the same user name to log in on all devices! I suspect that I will copy all those files into the file folders under Melody so as not to have to keep looking in two places. I lost all my emails. I have Gmail email accounts, but I use Mozilla Thunderbird to download my emails to my computer. I could have sworn that I had backed up my emails numerous times in the last year. If I did, I’ve got no clue where those files now live. I use Google Drive as a secondary back up. If you’ve never used it, you download the app and it creates a special Google Drive folder on the desktop of your desktop. You drop your files into that folder and they are saved to your Google Drive space. When I restored my files, the Google Drive folder was copied over. But, now it is just a regular folder. Google Drive doesn’t know it is there. To complicate things, I have Google Drive on my laptop. However, I only synced a couple of folders that I needed to use on both devices. I’m not sure how to proceed. I loathe to download the files to my laptop to resync them as it will tie up my slow DSL for days. My first test shows that moving folders to the Google Drive app creates a duplicate of the same name even though the same files are in the folder. What Do I Think of the Seagate External Hard Drive? I think it’s awesome! I’ve had to rebuild my computer files from a variety of sources: floppy disks, CDs, Zip Disks, thumb drives, online file management systems, etc. In all cases, it took several days to fully move all the files to my new computer. The Seagate drive did it in 2 hours. In my earlier attempts, it was more difficult to maintain file structure and there were always missing files. The Seagate software restored my files into the same directory structure that I painstakingly created on my PC. Despite the fact that I had an entire PC backed up the drive, there’s still space left. I could easily start a new back up plan and back up my laptop, which I will do once I have everything copied over. All in all, the Seagate External Drive is great! It’s got a lot of storage space for the price. The manual could be improved, but it was fairly easy to walk myself through the backup and restore processes. Best of all, my RootsMagic genealogy database, genealogy documents, and family photos have all been preserved. This is a huge relief! I’d highly recommend this drive!